A Dichroic glass lampwork heart was handmade by a U.S. artisan. 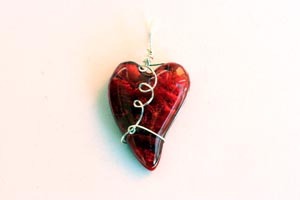 The heart has been hand-wire wrapped into a pendant. 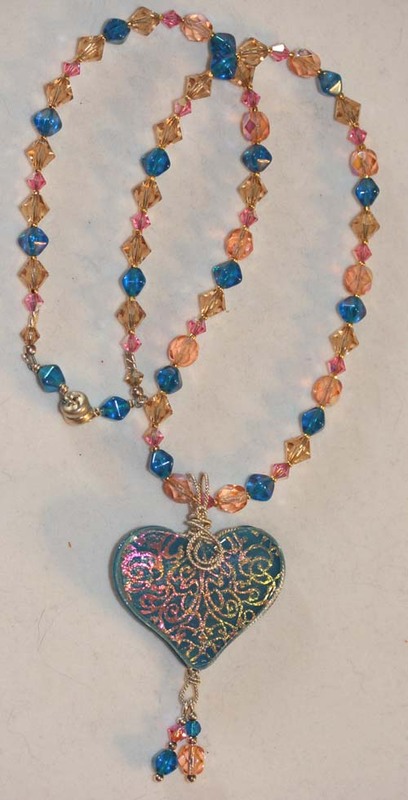 The necklace is made of austrian crystal and has a magnetic connector clasp. 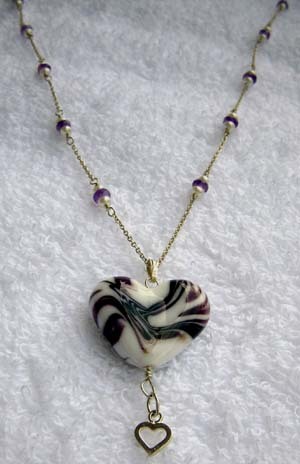 A Morretti glass lampwork heart necklace comes with a sterling silver and amethyst and fresh water pearl chain. A sterling silver heart dangles from the pendant. 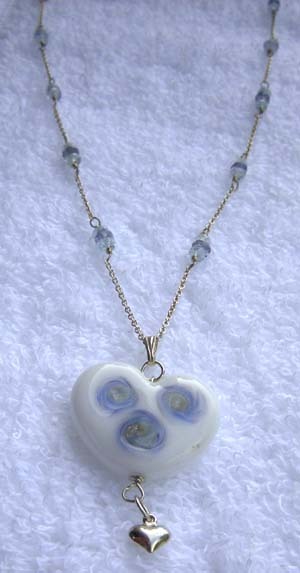 A Morretti glass lampwork heart necklace comes with a sterling silver and aqua, iolite, and fresh water pearl chain. A sterling silver heart dangles from the pendant. A Dichroic glass lampwork heart was handmade by a U.S. artisan. The heart has been hand-wire wrapped into a pendant. 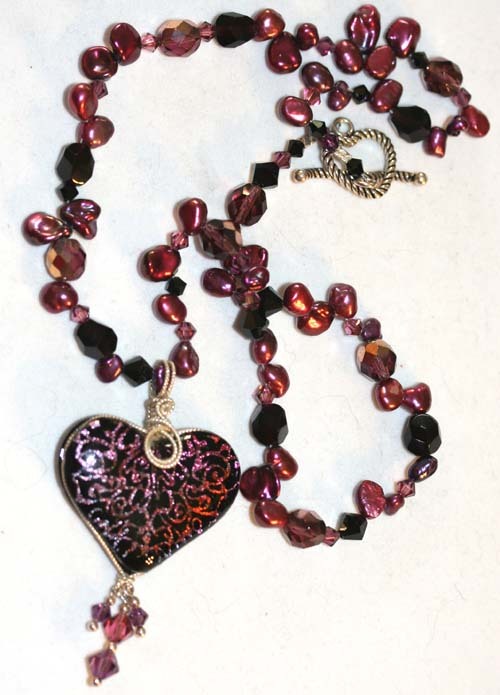 The necklace is made of vintage and crystal beads and has a sterling silver clasp. 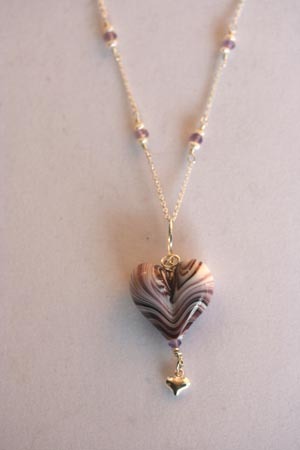 A Morretti glass lampwork heart necklace comes with a hand wire-wrapped sterling silver and amethyst and fresh water pearl chain. A sterling silver heart dangles from the pendant. Heart has been wire wrapped to fit any chain. A Dichroic glass lampwork heart was handmade by a U.S. artisan. The heart has been hand-wire wrapped into a pendant. The necklace is made of fresh water pearls and has a sterling silver clasp. 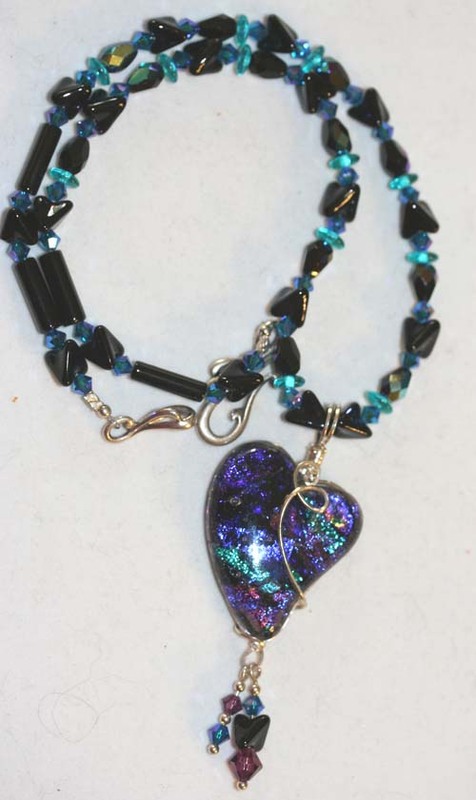 A Dichroic glass lampwork heart was handmade by a U.S. artisan. 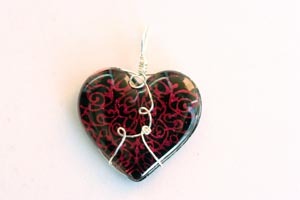 The heart has been hand-wire wrapped into a pendant. The pendant will fit any size necklace.